Ahoy Me Mateys! – Moments. Minutes. Memories….. 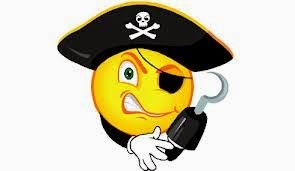 Happy Friday…..Arrrr! It’s talk like a Pirate Day! Shiver me timbers! This Beauty is doing the Friday happy Hornpipe! Yo ho ho, me Hearty and I, with our lil Lads, will weigh anchor and hoist the mizzen for a night on t’ town. Me Heartie is a Old Salt and and really knows how to weigh the anchor and hoist the mizzen! Don’t be a lubber, be smartly, grab the treasure map and find ye some plunder! Hope ye weigh anchor and hoist the mizzen for a fun weekend with all your Lads and Lassies! Happy Friday….Hey..It’s talk like a Pirate Day! Woot Woot, this lady is doing the Friday Happy Dance! Keith is pretty awesome on a date night! Don’t sit around and do nothing, get out and find you some treasure with your friends!